Intro: Bananas are the most valuable horticulture crop in Far North Queensland and perhaps the best known of all tropical fruit. Chinese settlers introduced bananas into the region in the 1800s. The banana plant is actually an enormous herb and because of its continuous reproduction, is regarded by Hindus as a symbol of fertility and prosperity. There is also a theory that the fruit of the Tree of Knowledge in the Garden of Eden was actually a banana. Kept in a fruit bowl, bananas will hasten the ripening of other fruit. History: Bananas originated in South EastAsia, New Guinea and Northern Australia. Shape: Varies in shape from boomerang to straight and from cylindrical to square. Weight/size: Size varies from 6cm to 35cm long. Colour: Skin colour depends on the variety and range from yellow to green to blue to red. The flesh of bananas varies from white to orange. Taste: Varies depending on variety. Buying/storage: Do not buy bananas with damaged skin. Unlike other fruit, they will continue to ripen rapidly at home. Storing bananas in the fridge will cause their skin to blacken, unless wrapped in newspaper. baked and fried. Banana leaves can also be used as a wrapping for savoury fillings and add an aromatic flavour to chicken and beef. Bananas can be frozen once the fruit is peeled and stored in a freezer bag. 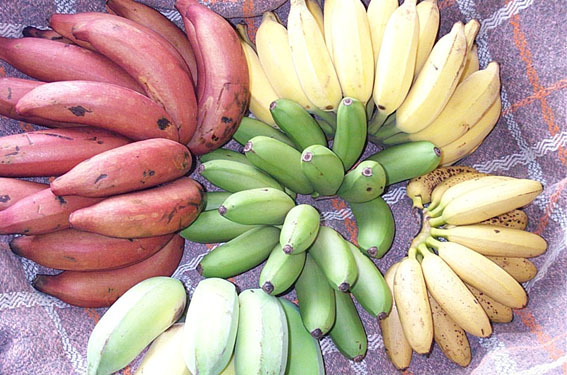 Varieties: Numerous varieties of bananas flourish in the region, including Red Dacca, Bluggoe, Ducasse, Cavendish, Lady Finger, Sucrier and Plantain.